Maria Sharapova delivered a beautiful finish to come out a winner at the BNL Internazionali d’Italia Wednesday night. The former world number one had a lot on her hands against Dominika Cibulkova who threatened at every point of the match until the skills of the Russian came together winning 3-6, 6-4, 6-2 on Corte Centrale on the grounds of Foro Italico in Rome. The series between the two has been quiet for the last four years but rekindles in their seventh meeting between one another. Cibulkova won their last match at the Australian Open taking down Sharapova in their second career three-setter. With the series dead even, the history would no doubt return and the fight from both players increase with intensity as they both needed a progression through the tournament. This was the second time in ten years that they met in the very same round that Sharapova won in three sets. The difficulty showed right away for the Russian as her serve didn’t come together giving Cibulkova a lot of room to dictate. We soon found the Slovakian with a 3-0 lead making Tomas Hogstedt come out and give his athlete a way to adjust her serve. Sharapova managed to pull one out of her serve getting on the board but with an effort to make the ground up. Cibulkova kept the edge on Sharapova through six before finding her chance to lock down the opening set in the eighth. The Russian nearly gave away her service game but a mistake from the Slovakian forced deuce before it was out of her hands. Sharapova still faced going down a set with Cibulkova back on serve in the ninth where she had to fight off a break point to force deuce. After two breaks, the Slovakian put some aggression in the short rally to win in 46 minutes. Cibulkova served 79 percent on the first serve with nine errors that allowed her to concentrate the offense on what was working for herself. 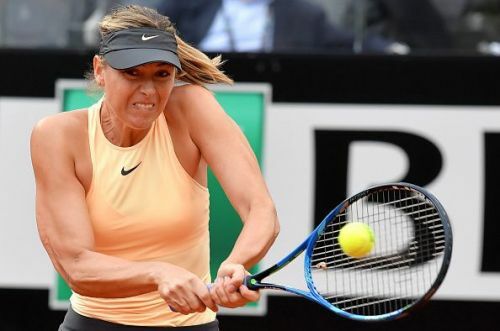 Sharapova’s 20 unforced errors and troubling second serve were problems that the Russian had to sort out if she wanted to make a push for dictating the rest of the match. She made her point in the opening game of the second set with Cibulkova following in tow with a hold of her own. They remained on serve until the seventh when Sharapova gained the upper-hand on the break taking a 5-3 lead. Serving out the set was a difficult task as she handed consecutive points to Cibulkova committing a fourth double fault in the game. The 29-year-old smashed the triple break point down the line away from Sharapova to keep the set going with the serve for a tiebreak in motion. The serve of Cibulkova didn’t go to plan as errors during deuce gave the Russian plenty of chances that brought the set to a close and a deciding set underway. It was a 53-minute comeback for Sharapova who improved with a lot more winners with the first serve scoring 80 percent of shots against Cibulkova who got into a low point that forced things to move on. Sharapova got the set running with her service that held off the 29-year-old before putting together two more victories that created a sizable gap. Cibulkova ended the shutout against her to avoid a double break but the leverage remained firm in the hands of Sharapova who took a 4-1 hold after five. The serve of Cibulkova was a very strenuous one as the Slovakian went deep into the game that she had such a hard time securing. After a few breaks and nearly ten minutes, the 29-year-old got the win. Sharapova answered with a serve that was hard for Cibulkova to play after putting in a lot of energy in the previous. It was enough to take her out which led to the Russian nailing down the eighth game with a huge victory to win the match in 2 hours and 30 minutes. With back to back victories on consecutive days, the surging Russian superstar will prepare for her match in the third round against the winner of the match between Daria Gavrilova and Garbine Muguruza.